Automated Backup automatically configures Managed Backup to Microsoft Azure for all existing and new databases on an Azure VM running SQL Server 2014 Standard or Enterprise. This enables you to configure regular database backups that utilize durable Azure blob storage. Automated Backup depends on the SQL Server IaaS Agent Extension. Azure has two different deployment models you can use to create and work with resources: Azure Resource Manager and classic. This article covers the use of the Resource Manager deployment model. We recommend the Resource Manager deployment model for new deployments instead of the classic deployment model. Automated Backup works with SQL Server 2014. If you are using SQL Server 2016/2017, you can use Automated Backup v2 to back up your databases. For more information, see Automated Backup v2 for SQL Server 2016 Azure Virtual Machines. Target databases must use the full recovery model. For more information about the impact of the full recovery model on backups, see Backup Under the Full Recovery Model. Target databases must be on the default SQL Server instance. The SQL Server IaaS Extension does not support named instances. Automated Backup relies on the SQL Server IaaS Agent Extension. Current SQL virtual machine gallery images add this extension by default. For more information, see SQL Server IaaS Agent Extension. The following table describes the options that can be configured for Automated Backup. The actual configuration steps vary depending on whether you use the Azure portal or Azure Windows PowerShell commands. 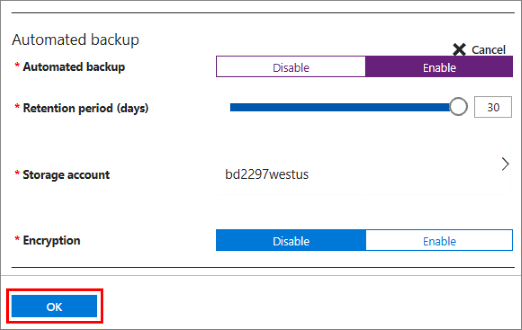 Automated Backup Enable/Disable (Disabled) Enables or disables Automated Backup for an Azure VM running SQL Server 2014 Standard or Enterprise. Retention Period 1-30 days (30 days) The number of days to retain a backup. Storage Account Azure storage account An Azure storage account to use for storing Automated Backup files in blob storage. A container is created at this location to store all backup files. The backup file naming convention includes the date, time, and machine name. Encryption Enable/Disable (Disabled) Enables or disables encryption. When encryption is enabled, the certificates used to restore the backup are located in the specified storage account in the same automaticbackup container using the same naming convention. If the password changes, a new certificate is generated with that password, but the old certificate remains to restore prior backups. Password Password text A password for encryption keys. This is only required if encryption is enabled. In order to restore an encrypted backup, you must have the correct password and related certificate that was used at the time the backup was taken. You can use the Azure portal to configure Automated Backup during provisioning or for existing SQL Server 2014 VMs. Use the Azure portal to configure Automated Backup when you create a new SQL Server 2014 Virtual Machine in the Resource Manager deployment model. In the SQL Server settings pane, select Automated backup. The following Azure portal screenshot shows the SQL Automated Backup settings. For existing SQL Server virtual machines, select your SQL Server virtual machine. Then select the SQL Server configuration section of the VM Settings. In the SQL Server configuration pane, click the Edit button in the Automated backup section. When finished, click the OK button on the bottom of the SQL Server configuration settings to save your changes. If you are enabling Automated Backup for the first time, Azure configures the SQL Server IaaS Agent in the background. During this time, the Azure portal might not show that Automated Backup is configured. Wait several minutes for the agent to be installed, configured. After that the Azure portal will reflect the new settings. You can also configure Automated Backup using a template. For more information, see Azure quickstart template for Automated Backup. Download and install the latest Azure PowerShell. Open Windows PowerShell and associate it with your account with the Connect-AzAccount command. If you provisioned a SQL Server virtual machine from the Azure portal, the SQL Server IaaS Extension should already be installed. You can determine if it is installed for your VM by calling Get-AzVM command and examining the Extensions property. If the SQL Server IaaS Agent extension is installed, you should see it listed as “SqlIaaSAgent” or “SQLIaaSExtension”. ProvisioningState for the extension should also show “Succeeded”. If it is not installed or failed to be provisioned, you can install it with the following command. In addition to the VM name and resource group, you must also specify the region ($region) that your VM is located in. If the extension is not already installed, installing the extension restarts the SQL Server service. If your output shows that Enable is set to False, then you have to enable automated backup. The good news is that you enable and configure Automated Backup in the same way. See the next section for this information. If you check the settings immediately after making a change, it is possible that you will get back the old configuration values. Wait a few minutes and check the settings again to make sure that your changes were applied. You can use PowerShell to enable Automated Backup as well as to modify its configuration and behavior at any time. First, select or create a storage account for the backup files. The following script selects a storage account or creates it if it does not exist. Automated Backup does not support storing backups in premium storage, but it can take backups from VM disks which use Premium Storage. Then use the New-AzVMSqlServerAutoBackupConfig command to enable and configure the Automated Backup settings to store backups in the Azure storage account. In this example, the backups are retained for 10 days. The second command, Set-AzVMSqlServerExtension, updates the specified Azure VM with these settings. It could take several minutes to install and configure the SQL Server IaaS Agent. There are other settings for New-AzVMSqlServerAutoBackupConfig that apply only to SQL Server 2016 and Automated Backup v2. SQL Server 2014 does not support the following settings: BackupSystemDbs, BackupScheduleType, FullBackupFrequency, FullBackupStartHour, FullBackupWindowInHours, and LogBackupFrequencyInMinutes. If you attempt to configure these settings on a SQL Server 2014 virtual machine, there is no error, but the settings do not get applied. If you want to use these settings on a SQL Server 2016 virtual machine, see Automated Backup v2 for SQL Server 2016 Azure Virtual Machines. To enable encryption, modify the previous script to pass the EnableEncryption parameter along with a password (secure string) for the CertificatePassword parameter. The following script enables the Automated Backup settings in the previous example and adds encryption. To confirm your settings are applied, verify the Automated Backup configuration. To disable Automated Backup, run the same script without the -Enable parameter to the New-AzVMSqlServerAutoBackupConfig command. The absence of the -Enable parameter signals the command to disable the feature. As with installation, it can take several minutes to disable Automated Backup. The following script provides a set of variables that you can customize to enable and configure Automated Backup for your VM. In your case, you might need to customize the script based on your requirements. For example, you would have to make changes if you wanted to disable the backup of system databases or enable encryption. To monitor Automated Backup on SQL Server 2014, you have two main options. Because Automated Backup uses the SQL Server Managed Backup feature, the same monitoring techniques apply to both. First, you can poll the status by calling msdb.smart_admin.sp_get_backup_diagnostics. Or query the msdb.smart_admin.fn_get_health_status table valued function. The schema for Managed Backup in SQL Server 2014 is msdb.smart_admin. In SQL Server 2016 this changed to msdb.managed_backup, and the reference topics use this newer schema. But for SQL Server 2014, you must continue to use the smart_admin schema for all Managed Backup objects. Another option is to take advantage of the built-in Database Mail feature for notifications. Call the msdb.smart_admin.sp_set_parameter stored procedure to assign an email address to the SSMBackup2WANotificationEmailIds parameter. Enable SendGrid to send the emails from the Azure VM. Use the SMTP server and user name to configure Database Mail. You can configure Database Mail in SQL Server Management Studio or with Transact-SQL commands. For more information, see Database Mail. Configure SQL Server Agent to use Database Mail. Verify that the SMTP port is allowed both through the local VM firewall and the network security group for the VM. Automated Backup configures Managed Backup on Azure VMs. So it is important to review the documentation for Managed Backup on SQL Server 2014. 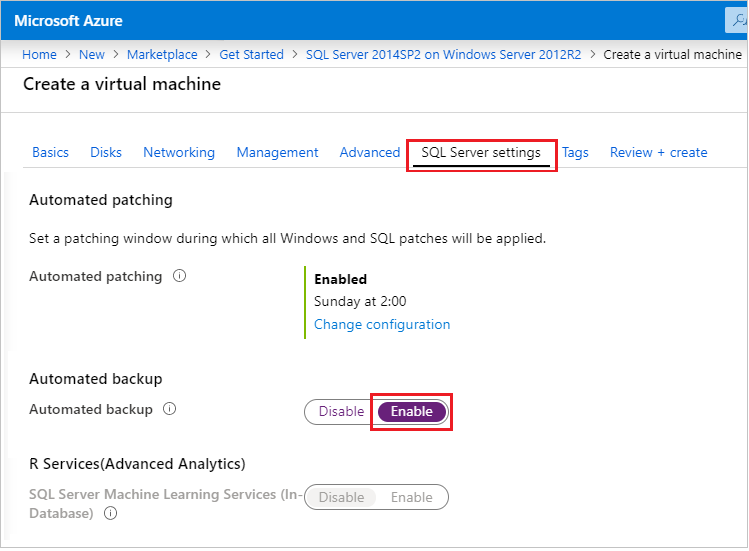 You can find additional backup and restore guidance for SQL Server on Azure VMs in the following article: Backup and Restore for SQL Server in Azure Virtual Machines. For information about other available automation tasks, see SQL Server IaaS Agent Extension. For more information about running SQL Server on Azure VMs, see SQL Server on Azure Virtual Machines overview.